The Potato Association of America is pleased to announce that the special issue of the American Journal of Potato Research (AJPR), Volume 96 Number 2 is now available online. 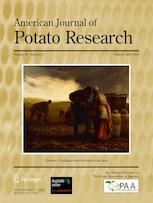 The focus of this publication is “The Contribution of Potatoes to Human Nutrition.” It is the hope of the PAA that this special issue highlights the unique contribution of potato to the human diet, and concurrently expands AJPR readership and the journal’s stature within the scientific community. Please consider sharing the news of this recent publication through your institution and social media outlets.